Amazon Echo is a hands-free speaker you control with your voice. 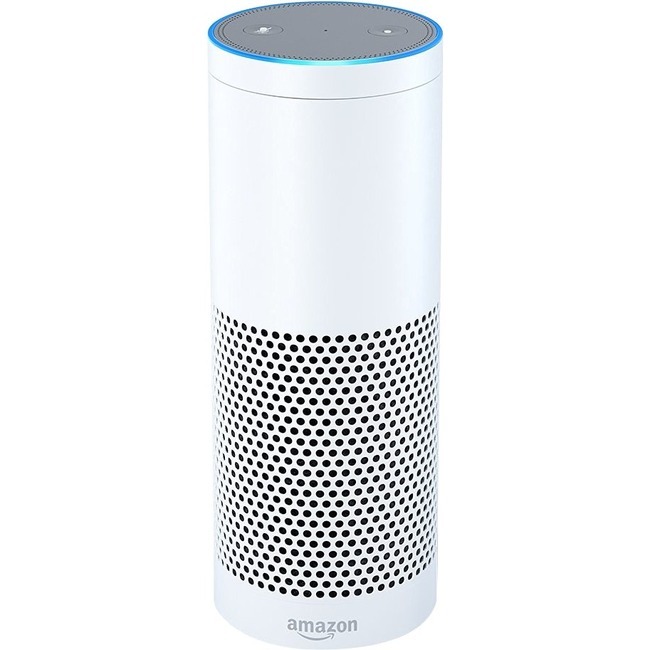 Echo connects to the Alexa Voice Service to play music, provide information, news, sports scores, weather, and more-instantly. All you have to do is ask. Echo has seven microphones and beam forming technology so it can hear you from across the room-even while music is playing. Echo is also an expertly tuned speaker that can fill any room with 360° immersive sound. When you want to use Echo, just say the wake word ‘Alexa’ and Echo responds instantly. If you have more than one Echo or Echo Dot, you can set a different wake word for each-you can pick ‘Amazon’, ‘Alexa’ or ‘Echo’ as the wake word. Domestic orders are shipped within 2 business days from receipt of payment. Domestic shipments are sent via standard UPS or Fedex service. Standard shipping service may not be available to some addresses. Additional charges may apply. We do not provide expedited shipping or order processing. Orders to PO boxes, Alaska, Hawaii, Puerto Rico, US protectorates, and military addresses require an additional 3-4 business days of processing time before shipment. Import duties, taxes and charges are not included in the item price or shipping charges, they will be billed to the recipient. These charges are usually collected by the shipping company at the time of delivery. On customs documents we do not mark merchandise price below the sale price, or mark items as ‘gifts’. Government and shipper regulations prohibit such behavior. International orders are shipped via various air cargo carriers which are selected by our warehouse when your order is processed. International orders require 3-4 business days of processing time before shipment. Shipments to PO boxes must be sent via postal services. Additional charges may apply. Heavy or over-sized shipments may not be eligible for export to some countries or incur additional charges. Please contact us before placing your order if you require combined shipping for multiple items. Please inspect your item as soon as it arrives, we only accept reports of shipping damage within 14 days from delivery. We understand that our customers may change their mind after purchasing a product. We will accept returns on these orders, although the shipping charges and a restocking fee will be withheld from your refund. When you submit your payment, your order will be automatically processed. We may no longer be able to change or cancel your order. After the order is recived, we cannot update your shipping address address. The order will be shipped to the address you submit with your payment. Please contact us with any special requests before ordering. Scroll down and click on ‘ask a question’ if you would like to send us a message. The product’s description is automatically generated with information from manufacturer product catalogs and other content providers. Please excuse any image and typographical errors.